Even with seatbelts and airbags, people can fracture bones in auto crashes. If someone else caused the wreck, you could be eligible for compensation for broken bones after a car accident. Most fractures from auto collisions happen when there is direct trauma, such as the arm or leg hitting the dashboard or door. When a person ejects from the vehicle, both the crash through the window or windshield and the impact upon landing can break bones. The other vehicle colliding with your body can also cause fractures. You can break almost any bone in a crash. A skull fracture can result from the head striking the windshield, dashboard, or door frame. Drivers often suffer broken wrists from having the joints flexed, holding the steering wheel, at the time of impact. Chest fractures from steering wheels are also common when operating a motor vehicle. Depending on the force of the collision, a person inside a car or truck can suffer broken arms, collarbones, neck, back, hips, pelvis, legs, or feet. Symptoms of a fracture include intense pain and not be able to move the injured area. You can also experience swelling, bruising, and tenderness. Depending on the type of fracture, the hurt area might look “out of place” or distorted, or a piece of bone might poke through the skin. 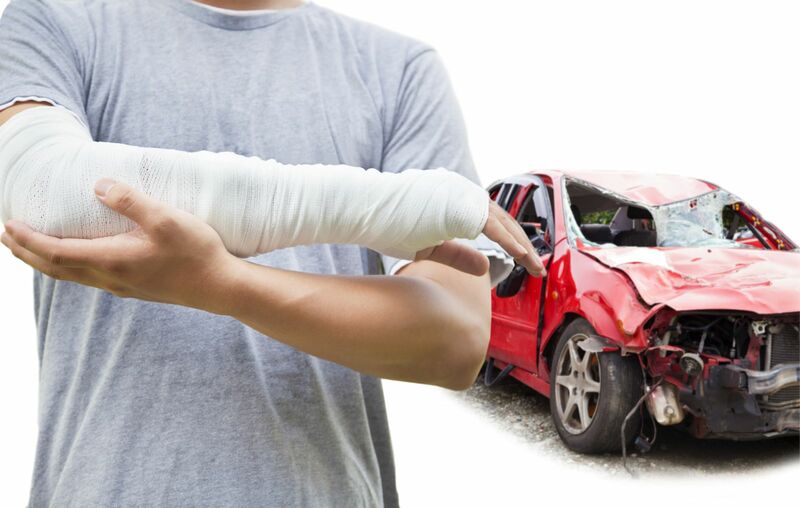 Be aware that you might not realize you have broken bones after a car accident. Some people suffer from a broken bone for days before getting medical attention because they mistakenly think it is a sprain or strain. Waiting to get medical treatment for a fracture can result in the bone healing incorrectly. If the bone broke through the skin, you could develop an infection in the wound and the bone. Your doctor will perform a physical examination and most likely verify the diagnosis with X-rays or other imaging tests. You might need multiple imaging studies for an accurate diagnosis and precise exploration of the amount of damage. Your fracture might be simple, clean, and closed, or you could have a shattered bone that penetrated the skin. Because there is such a wide range of possibilities when it comes to fractures, there are multiple treatment options. Your doctor will tailor the treatment plan to your situation. Broken bones need weeks or months to heal correctly. Even if you are no longer in pain, your bone might not be strong enough for ordinary activity, so be sure to follow your doctor’s orders to avoid setbacks and complications. Many people need to go through weeks or months of physical therapy to complete the healing, rebuild the muscle strength, and regain range of motion. Complex fractures do not always heal well. Some people endure long-term pain after a significant broken bone. You might not have as much strength, flexibility, mobility, or function in the injured area after you complete treatment. Shattered bones and fractures that break through the skin or require surgical repair have a risk of infection of both the bone and surrounding tissue. If you missed work because of the wreck and recuperation time, we can add your lost wages to your claim. In addition to those items, you can get an award of damages for your pain and suffering. If your fracture left you with long-lasting impairment, you can get compensation for that as well. For example, your additional damages can include ongoing medical treatment, decreased future income, disability, long-term assistance, and loss of enjoyment of life. If you broke a bone in an auto accident that was not your fault, you might have a right to a settlement or an award of damages. Call Max Meyers Law at 425-399-7000 today to set up your free consultation. We will evaluate your claim at no charge to see if you should pursue an injury claim. We investigate our cases and work hard to get our clients all the compensation they deserve.